Two days after what was probably the most fun wedding party ever, my in-laws hosted brunch for our family at the Grand Concourse. My mother-in-law Lynn was glowing with pride in a beautiful floral print pink dress and matching cardigan as she welcomed everyone to another celebration as a big, new family. The Grand Concourse lives up to its name in more ways than one. It’s a giant restaurant set in an old train station, and is famous for its vast brunch buffet complete with everything from roast beef to bananas foster. But what was it that tickled our family the most? Yes, the doughnut machine. A mold dropped perfectly shaped pieces of doughnut batter into oil just long enough for them to cook and then moved them along to a conveyor belt where the grease drained off of them. Next to the machine were two bowls where the doughnut could be dipped in either powdered sugar or cinnamon sugar. Needless to say, we were all incredibly entertained by this. Especially Joe and Lynn. For almost as long as I’ve known Joe, I’ve known exactly where he gets his eating habits. It’s certainly not my father-in-law, who like me, thinks vegetables really are a food group. Nope, it’s definitely his mom. Their shared love for burgers and fries, anything with blueberries in it, and fresh, hot doughnuts is unmatched. We arrived in Louisville late one night on a flight from DC and saw that the Krispy Kreme nearby had the “hot doughnuts” sign lit up. I blinked and we were at the drive-thru window. 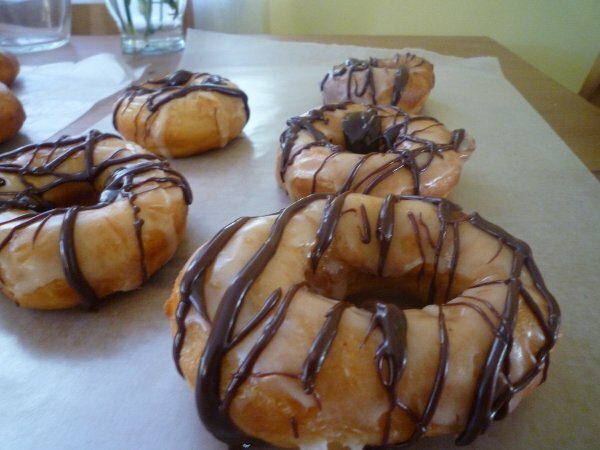 On another occasion when I’d had just about enough of grad school, I closed the books for a day and made yeast doughnuts with a honey glaze and sent half of them with Joe when he went to visit his parents. I was later asked why only a half-dozen had been delivered. It was a long summer for Lynn as she fought valiantly to stay well amidst all of her treatments and enjoy the wedding festivities. By the time the brunch in Pittsburgh came around, she didn’t have much in the way of an appetite anymore. But when my brother returned to our table with two fresh mini-doughnuts for her (one of each kind, of course! ), she took a bite of each. It was the first thing I’d seen her eat in a long time and one of the few foods she said still tasted good to her. Had I the time, I’d have been churning out doughnut recipes for all of August. Things changed very quickly when we returned from Pittsburgh. A few posts ago in “Bake it All Away,” I mentioned that the reason I’d baked bread that particular day was because I was feeling sad and powerless. It was right around that time that Lynn’s condition started to deteriorate. All I could do was make frozen meals for my father-in-law, sit by Lynn’s bedside singing and trying to remember the words to songs from “Evita” (her favorite musical), and play Rachmaninoff recordings so at least she might dream about being at spectacular performances at the Kennedy Center. Then Hurricane Sandy hit and gave us Monday and Tuesday off of work this week. It was kind of a relief and gave me time to do something a little bit fun and lighthearted for a little bit of distraction. 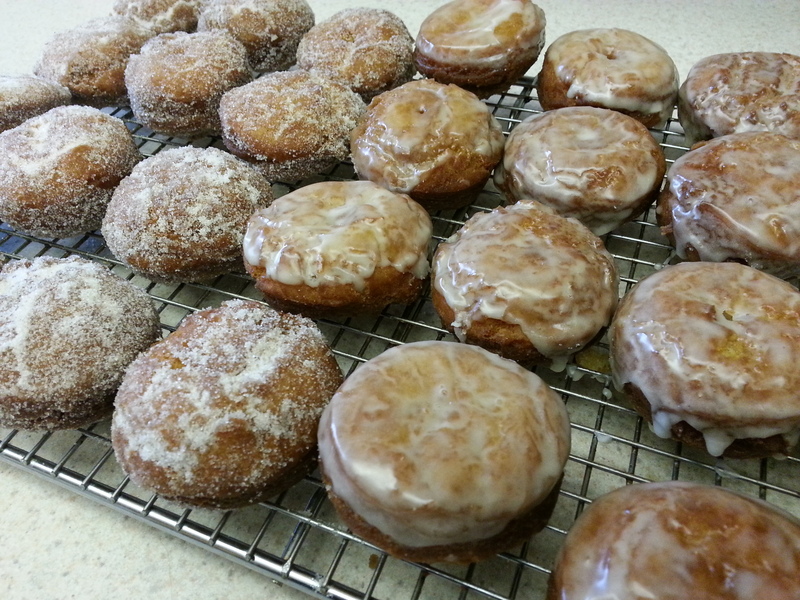 I’ve been promising Joe for a month that I’d make cider doughnuts for him. But we spent most of our October days being where we truly needed to be, with our family. So when I suddenly had unexpected free time on Tuesday morning, I decided to spend it elbow deep in flour and all the spicy sweet smells of autumn. Cider doughnuts are cake doughnuts, so there’s no rise time involved here. That said, the dough does require some chilling prior to cutting, so make sure you have a good chunk of time on hand before starting. Powdered sugar mixed with just enough cider to achieve a glaze that ribbons off of a spoon. Combine the apple cider, orange peel, and bourbon in a small pot over medium heat and simmer until it reduces to between a 1/3 and ¼ of a cup of liquid. Discard the orange peel and set the liquid aside to cool. 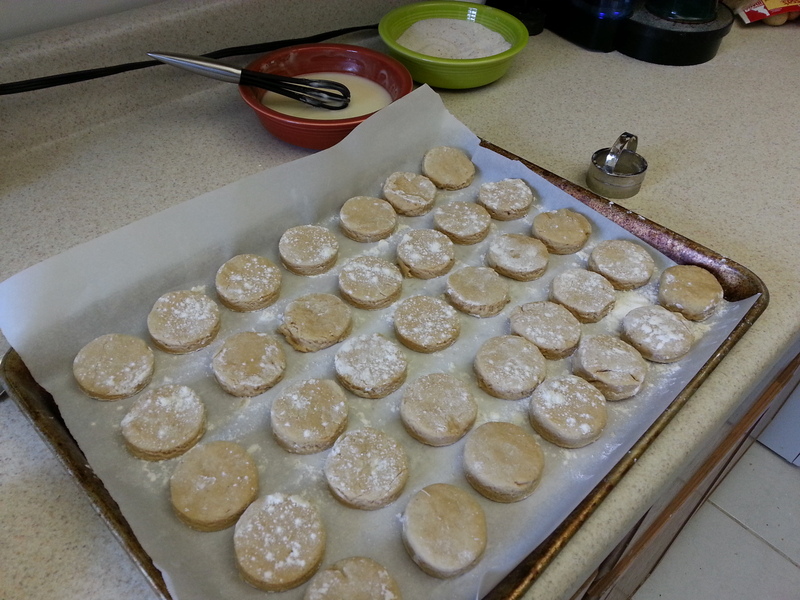 In a large bowl, mix together the flour, baking powder, baking soda, salt, cinnamon, and nutmeg. 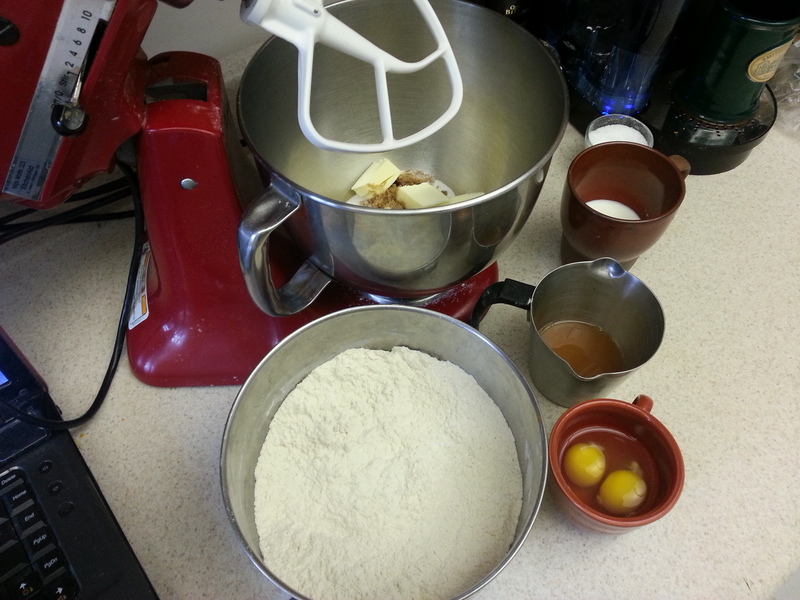 In the bowl of a stand mixer, beat the sugar and butter together until smooth. With the speed turned to low, add the eggs one at a time, mixing in between additions, and then add the cider reduction and milk. Mix until well blended. Add the flour mixture to the wet ingredients and mix just until everything comes together. You’ll have a sticky, loose dough. Line a baking sheet with parchment paper and dust it with flour. 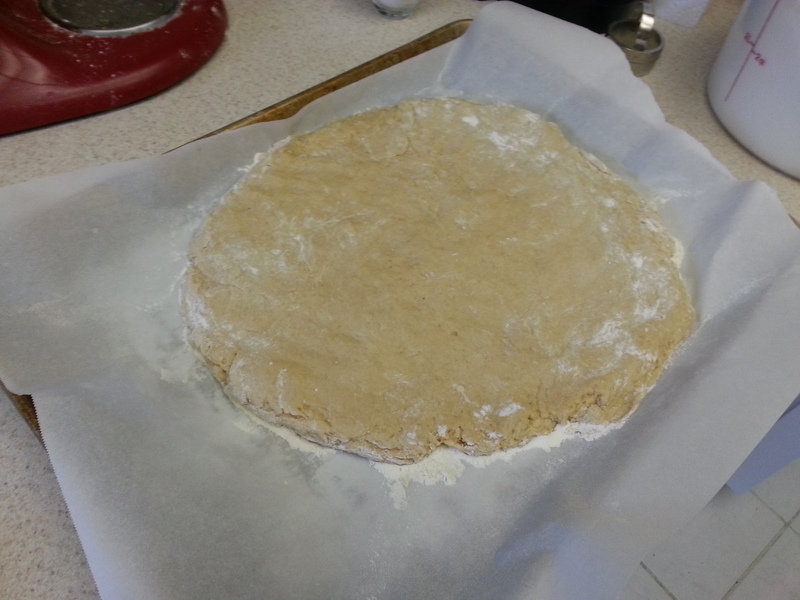 Scrape the dough out of the bowl and onto the baking sheet and flatten it with your hands until it is ½ in. thick. Freeze for 20 minutes or until slightly firm. Cut doughnuts into desired shapes and place them on a second baking sheet lined with floured parchment paper. I used a 2 in. biscuit cutter and got 3 dozen small doughnuts. 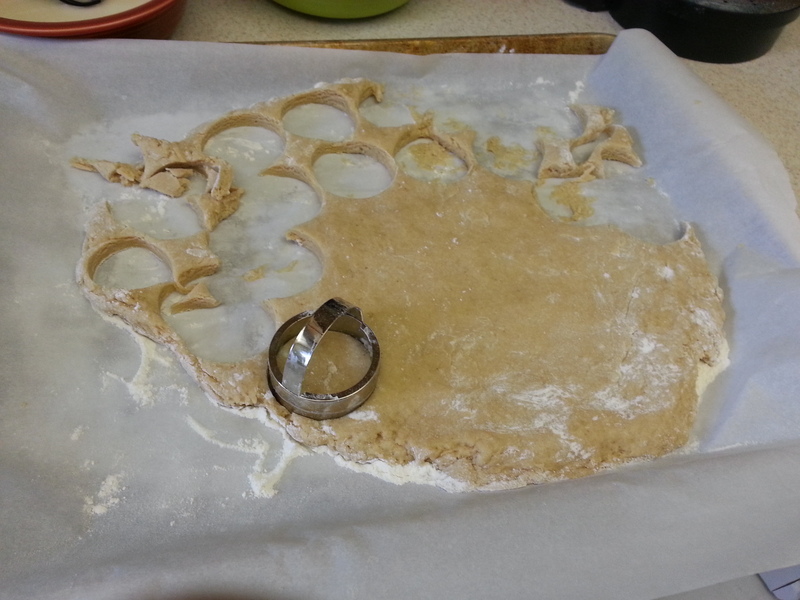 A larger biscuit cutter can also be used, in which case you should also cut out the middles (a shot glass dipped in flour works well) and use them to make doughnut holes. If a 1 in. 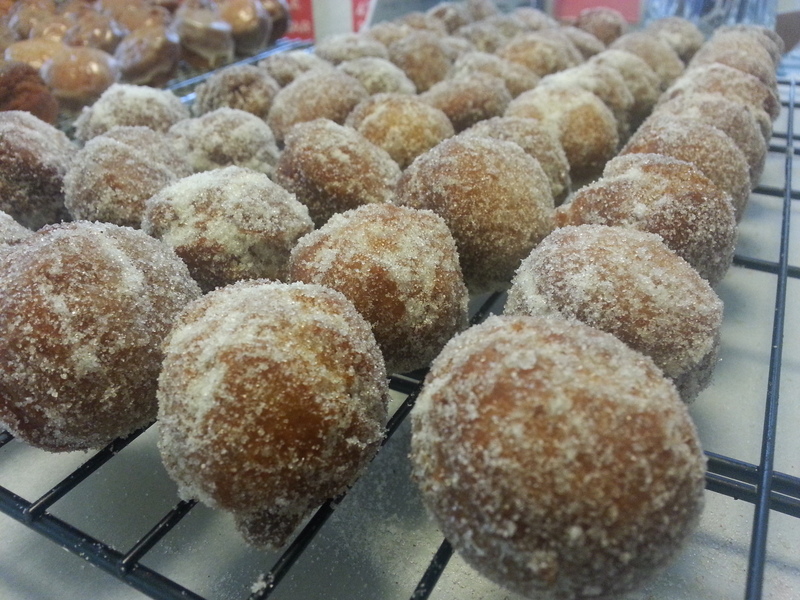 cutter is used to make only doughnut holes, the yield is about 10 dozen. These fry fairly quickly and it’s easier to avoid raw middles with smaller doughnuts. Refrigerate the pan of doughnuts while you prepare the frying oil and toppings. Put each topping in a shallow bowl and set them next to a wire rack placed over a piece of aluminum foil. 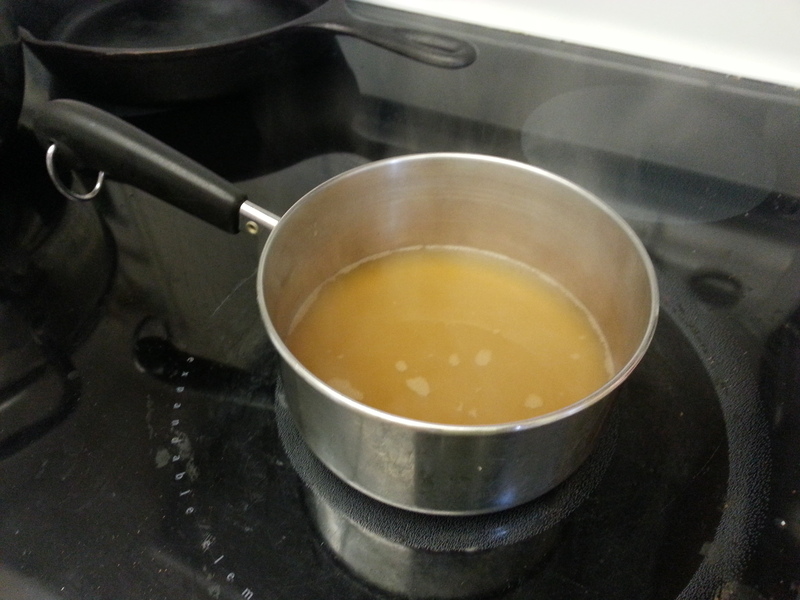 Fill a pot with at least three inches of peanut or corn oil. They both have high smoke points, but peanut oil is my favorite for frying. Heat the oil over a burner set to medium-high until it reaches 350-360 degrees. Keep the oil within that temperature range while you fry the doughnuts and you won’t end up with greasy pastries. If you filter your oil at the end to reuse it, you’ll notice that you lose very little when you pay attention to temperature control. 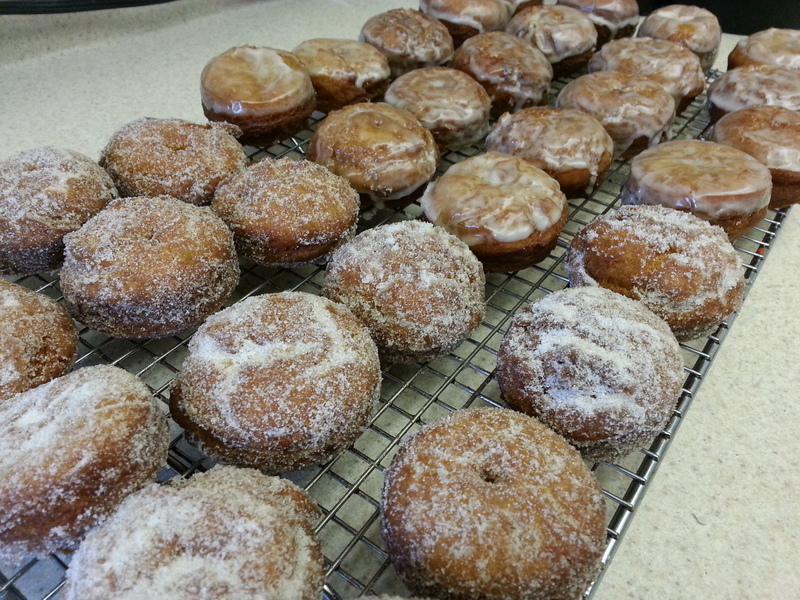 Fry batches of 5-6 doughnuts at a time for 30-60 seconds on each side or until brown. Two chopsticks or butter knives make it easy to flip them. One batch I made had a few that were a little doughy in the middle, so I’d lean toward the longer cooking time for larger doughnuts. 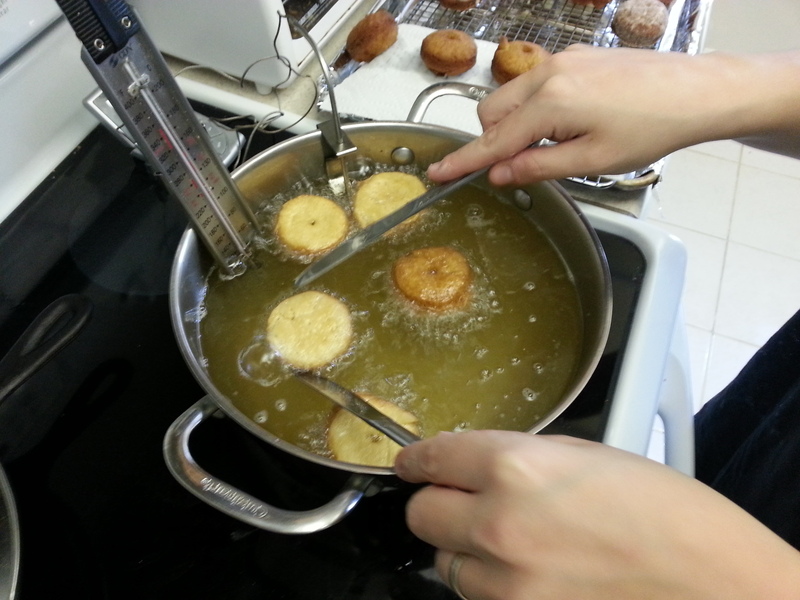 Doughnut holes cook much faster, so watch them closely. Check the oil temperature between each batch and adjust the heat accordingly. Drain the doughnuts on paper towels for a few seconds and then either dip in the glaze or roll in the sugar. Enjoy warm with a cup of very strong coffee for maximum joy. As Joe and I ate them and relaxed on a much-needed surprise day off of work, I couldn’t help but smile and think of Lynn. She’d have been right there with Joe, probably play-fighting for the last one on the plate. If you want to see some of Lynn’s favorites, check out other recipes I’ve made for her: There’s Easter Bread (she loved it for grilled cheese sandwiches), Flourless Chocolate Cake with Italian Meringue for the chocoholics, and last year’s special birthday treat, a Coconut Layer Cake for the true southerners out there. I’ll always love this special lady for everything she was: A generous, loving, kind, intelligent and empowered woman with more wit in her little finger than I have in my entire body. 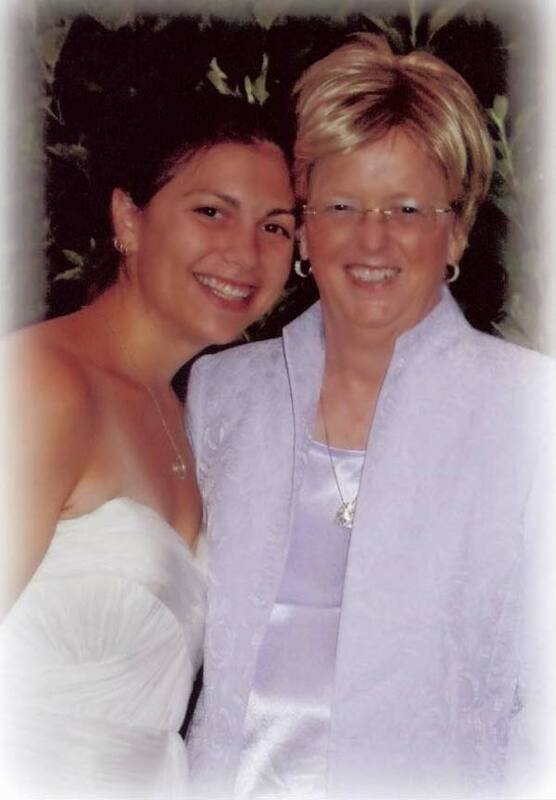 I feel blessed to have known her, and even more special to be a part of her family forever. I come back to this and read it again and again…so sweet, so tender and so true.